Making it's New York Unicycle Club debut at the first Sunday of March meeting is the backpedaling unicycle invented and built by Tom Miller of the Unicycle Factory. Tom Miller is the creator of the "Crab cycle" a unicycle that rolls sideways as you pedal and the side by side double wheeler, put together this new one of a kind unicycle that requires you to pedal backward in order to go forward. 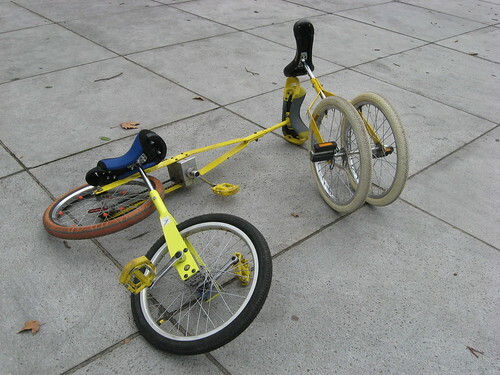 As you can see in the above video, the unicycle operates much like a double wheel unicycle where one wheel rests on top of the other with the top wheel driving the second. The major difference with this new unicycle is that you are riding a lot closer to the ground with only one wheel required. Having extensive experience mounting and riding his own double wheel unicycle, David was able to ride this unicycle immediately . 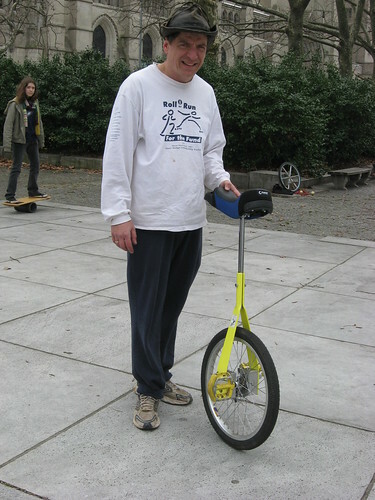 This latest unicycle joins his exclusive collection of Tom Miller unicycles pictured below. No one else at the meeting demonstrated an ability to ride the new backpedaling unicycle. However, all attendees of the club meeting had a good time riding and hanging out. Check out the slide show of all of the photos taken at the March meetings.